It is believed that Mohun Bagan played the first match on this very ground against the students of Eden Hindu hostel.In 1891, with the help of the Maharaja of Shyampukur, Durga Charan Laha, club ground was relocated to his ground at Shyampukur. That place is now known as Shyampukur Laha Colony. Later, with the help of Mr. Harry Lee, the chairman of Kolkata Municipal Corporation, the ground was again shifted to Shyam Square. The ground was shared with the Aryans Club and Bagbazar Club. Club Secretary Subedar Major Sailen Basu was the First and Highest Ranking Indian Officer of the 49th Bengal Regiment. Basu’s role for the club and team making is remarkable. Such as the arrangement for a new club tent, a new ground, making a good football team and increase the number of Club members. 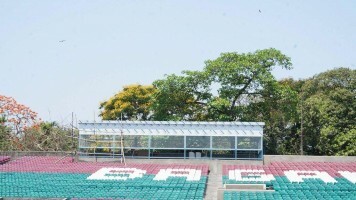 In 1900, Mohun Bagan became the partner of Presidency College and shared the same ground at Kolkata Maidan (Ground). Mohun Bagan continued to play here for 15 years. Then in 1915, Mohun Bagan got the ground of National AC. On this ground, Mohun Bagan played till 1963. In 1915, that ground was stretched east–west. But afterwards, it became north–south like the other club grounds in Kolkata Maidan. Presently, that ground is occupied by one of the oldest clubs of Kolkata, the Aryans Club, who shares the ground with the East Bengal Club. The current Mohun Bagan Ground is one of the best football grounds in Kolkata. Fitted with the floodlights and concrete gallery. It is slightly high at the center circle. and lower at the side lines. So that the rain water drained off easlily. The grass of this lush green carpet has been imported from Brazil. No Followers found. Be the first one to follow! No Photos found. Be the first to upload a Photo. No Videos found. Be the first to link a Video. No Teams found. Be the first to link a Team. No Events found. Be the first to link an Event.